Get important revision notes on CBSE Class 12th Chemistry, Chapter 10 - Haloalkanes and Haloarenes. These notes are based on latest CBSE syllabus and are helpful for quick revision of the chapter. In this article, you will get important revision notes on CBSE Class 12th Chemistry: Chapter 10 - The Haloalkanes and Haloarenes, to give you a quick glance of the chapter. 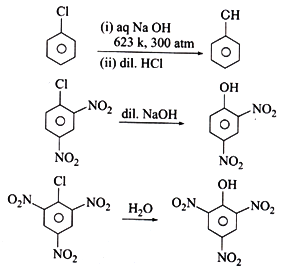 These NCERT based notes are very important for CBSE Class 12th Chemistry. In aliphatic or aromatic compounds, the replacement of hydrogen atom(s) by halogen atom(s) results in the formation of alkyl halide (haloalkane) and aryl halide (haloarene), respectively. In case of haloalkanes, halogen atom is attached to the sp3 hybridised carbon atom of an alkyl group whereas in haloarenes, halogen atom is attached to sp2 hybridised carbon atom of an aryl group. The halogen derivatives of hydrocarbons may be classified as fluoro, chloro, bromo or iodo compounds according to the type of halogen present. Depending upon the number of halogens present, the halogen derivatives can be classified as mono, di, tri or polyhalo compounds. On the basis of the nature of the carbon to which halogen atom is attached, halogen derivatives are classified as 1o, 2o, 3o, allylic, benzylic, vinylic and aryl derivatives. 1o, 2o and 3o halides: halogen atom is bonded to primary, secondary or tertiary carbon atom of an an alkyl group. Allylic halides: Halogen atom is bonded to an sp3-hybridised carbon atom next to carbon-carbon double bond (C=C) i.e. to an allylic carbon. Benzylic halides: Halogen atom is attached to an sp3 - hybridised carbon atom next to an aromatic ring. Vinylic halides: Halogen atom is bonded to an sp2-hybridised carbon atom of a carbon-carbon double bond (C = C). Aryl halides: Halogen atom is bonded to the sp2-hybridised carbon atom of an aromatic ring. Note: Here X represents a halogen atom, i.e., X= F, Cl, Br, I.
X is more electronegative than carbon. So, the C-X bond is polarized with C having a partial positive charge and X having a partial negative charge. Chlorination or bromination of alkane usually gives a complete mixture of isomeric mono and poly halo alkanes. An alkene is converted to corresponding alkyl halide by reaction with hydrogen chloride, hydrogen bromide or hydrogen iodide. The hydroxyl group of an alcohol is replaced by halogen on reaction with concentrated halogen acids, phosphorus halides or thionyl chloride to give the corresponding alkyl halide. Alkyl iodides can be prepared by the reaction of alkyl chlorides/ bromides with NaI in dry acetone. Alkyl fluorides can be prepared by heating an alkyl chloride/bromide in the presence of a metallic fluoride such as AgF, Hg2F2, CoF2 or SbF3. This involves the direct halogenation of benzene ring in the presence of Lewis acid catalysts like iron or iron (III) chloride. This involves the conversion of aryl amines to aryl fluorides via diazotisation and subsequent thermal decomposition of the derived aromatic fluoborate to produce the corresponding aryl fluoride. Treatment of diazonium salt with potassium iodide gives aryl iodide. • Alkyl halides are colourless when pure but bromides and particularly iodides develop colour when exposed to light. • The alkyl halides have higher molecular mass as compared to alkanes. • Halogen compounds have higher boiling points than the corresponding hydrocarbon. This is because the greater polarity as well as higher molecular mass as compared to the parent hydrocarbon causes the intermolecular forces of attraction (dipole-dipole and van der Waals) to be stronger in the halogen derivatives. • The density increases with increasing number and the atomic mass of the halogen. • Halogen compounds are less inflammable than the hydrocarbons. The inflammability decreases with increasing halogen content. Nucleophilic substitution: A nucleophile attacks the haloalkane which is having a partial positive charge on the carbon atom bonded to halogen. 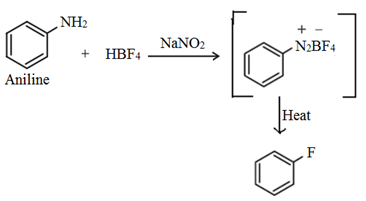 Halide ion separates following a substitution reaction. The nucleophilic substitution reaction can proceed via SN1 mechanism or SN2mechanism. • Unimolecular nucleophilic substitution, SN1: This type of nucleophilic substitution takes place in two steps, first step being the rate determining step involves the formation of carbonium ion. • Bimolecular nucleophilic substitution, SN2: This type of nucleophilic substitution takes place in one step. The incoming nucleophile interacts with alkyl halide causing the C−X bond bond to break while forming a new C−OH bond. Reaction with Magnesium: Alkyl halides react with magnesium in the presence of dry ether to form corresponding alkyl magnesium halide which is also known as Grignard’s reagent. Recation with sodium: Alkyl halides react with sodium to form an alkane with double number of carbon atom than that present in alkyl halide. This reaction is also known as Wurtz reaction. (i) Geometrical isomerism: It arises due to the presence of like groups on the same side of the plane (cis) or on the opposite side of the plane (trans). 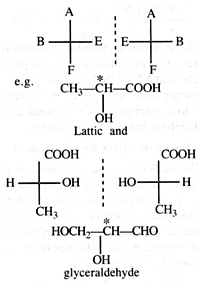 • Presence of chiral carbon or asymmetric carbon, i.e., The C attached to four different groups. Chiral carbon is denoted as C*. • reactivity towards chiral reagent. A mixture containing two enantiomers in equal proportions is called racemic mixture. A recemic mixture is optically inactive as the effect of one isomer gets cancelled by another isomer. The process of conversion of enantiomers into a racemic mixture is known as racemisation. 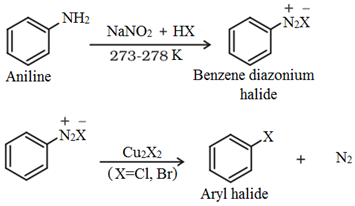 Aryl halides are almost unreactive towards nucleophilic substitution reaction. This is because of double character of C – X bond due to resonance. Therefore, it is difficult to remove X from C – X bond. Presence of an electron withdrawing group like NO2 group increases the reactivity of aryl halides towards nucleophilic substitution reaction. NO2 group increases the reactivity more when present at o- and p- position due to the increased delocalization of negative charge involving NO2 group.